Happy happy Friday, friends! 13 more days until Christmas. Ahh!! Still so much left to do! Are you ready? At least my house is all decorated and ready to go! 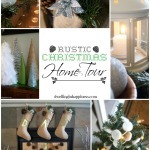 Did you get a chance to see my Christmas Home Tour on Wednesday? 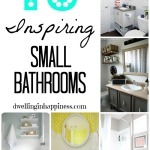 If not, you can see it HERE (as well as 18 other blogger’s beautiful homes!). If you did get to visit, then this little lighted star pallet sign should look familiar! We have a fireplace under where our T.V. hangs, but we don’t ever use it. The back of our house gets so cold, which is where Jade’s room is. We don’t use the fireplace because our living room will get too warm, which is where the furnace is, causing the heat to stay off and Jade’s room to get colder. So, we pretty much just have it there for looks. And we don’t have much of a mantel, either. Boo. Anyway, my point is, since we don’t use it, I might as well cover it up with something pretty! I had a ton of scrap pallet wood in the garage, so I made this little star Christmas pallet sign!! Although, it’s not little. It’s quite large. 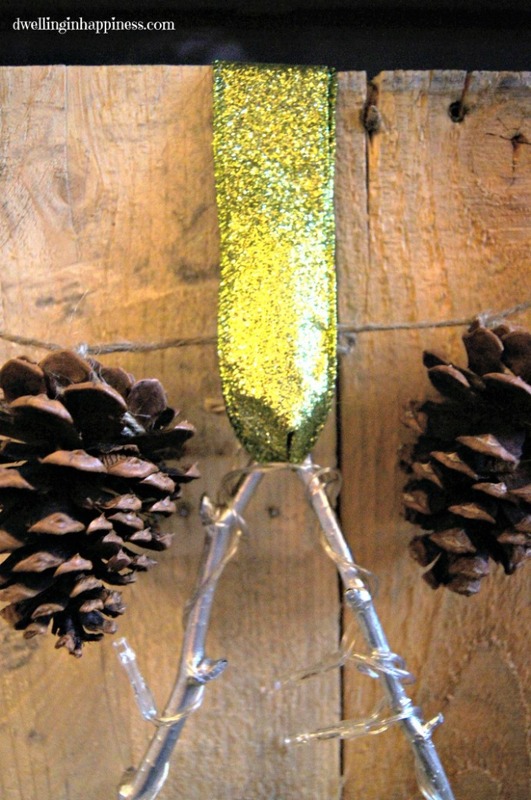 It’s the perfect addition to our “rustic glam” Christmas decor this year! 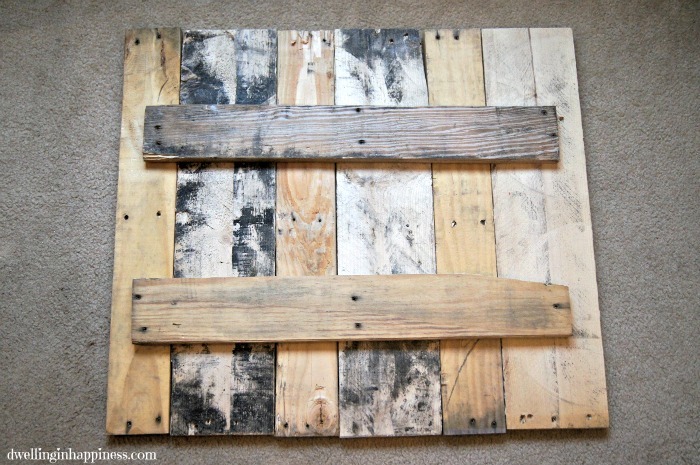 To make it, I used about 6 pallets that were all the same length, and laid them out on the sides that I thought looked best. Some of the boards were thinner than the rest which I thought looked better than using all the same size. Because I wanted this project to be done in one day, I went the somewhat lazy easy route and used wood glue. No nails needed! Once I had the wood placed where I wanted it, I flipped them all over to the back. I used two smaller pallets that were definitely not going to be used for anything else, put a generous amount of wood glue on the back of them, and then glued them down behind all the pallets. The wood glue instructions say to clamp the glued pieces together for an hour. I don’t have any clamps, so really heavy boxes were used instead. I piled them on top and left them for several hours instead, just to be safe. It worked like a charm, and the glue held beautifully. Phew! 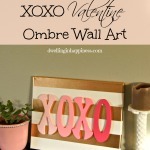 I love when projects are that easy! I thought about staining or painting the wood, but I actually really love it the way it is. Au natural is totally working for me, here! 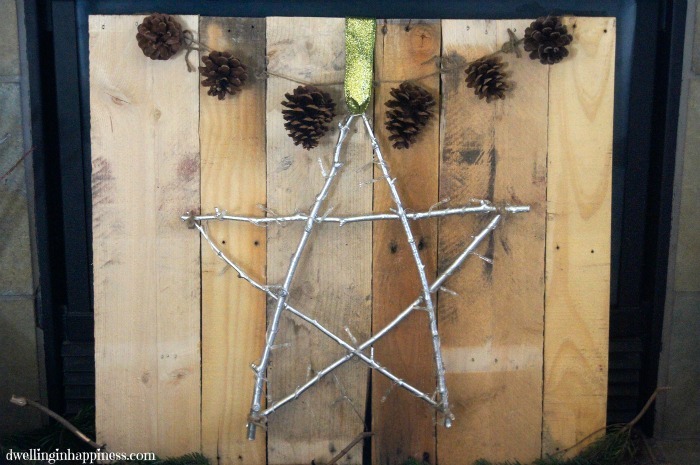 I used sticks from a wood pile I have from my neighbors fallen tree, and made a large star. While the glue dried on the pallets, I gathered 5 sticks that were about the same length and thickness. Then, I spray painted them with metallic silver spray paint. Super simple. I used hot glue to glue the corners together. I also ended up tying some twine around the corners too, because the hot glue apparently wasn’t enough and it fell apart. I added more hot glue the next time along with the twine, and it’s held together great. I love the silver, it pops so beautifully against the wood! For the lights, I used battery operated LED lights. (I purchased THIS ONE on Amazon for only a couple bucks!) I just weaved them through the perimeter of the star. What I love about how my wood worked out is that I just fed the cord and the battery pack through that little hole in the bottom. No ugly battery and cords showing! 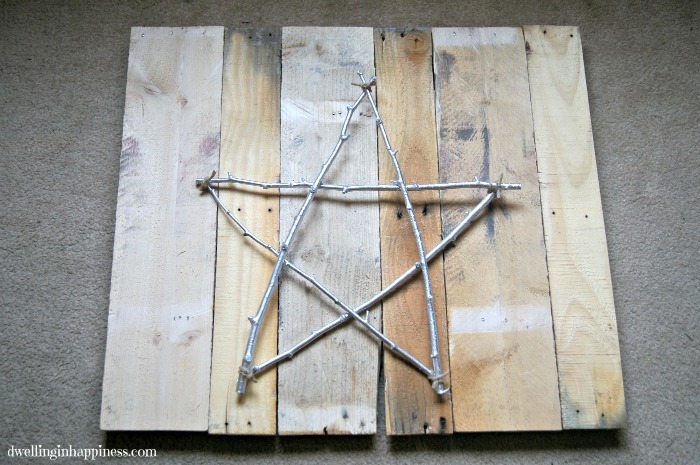 I kind of want to use the pallet part again after Christmas, so I didn’t glue the star to the boards. 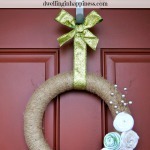 I used some glitter green ribbon (the same I used to hang my rustic glam Christmas wreath which you can see HERE!). I threaded it through the top of the star, and then just used a thumbtack to attach it to the back of the wood. I also had some pinecone ornaments I had made last year but wasn’t using, so I tied them together and added it across the top, using push pins to attach it to the back. …and on! This sign is the perfect size to lean against our fire place under the stockings! We don’t have a nativity set yet, but I’ve got my eye on a few nice ones. When we do get one, this will be the most perfect backdrop for it! What do you think? It can’t get anymore simpler than this! And, technically this isn’t Christmas-ey either, so you could really leave it up all winter long. Yay! This couldn’t possibly be any cuter Amanda!!! LOVE it!!! Aw thank you, Kristi!! 🙂 Hope you have a fab weekend my friend! Nature things spraypainted metallic are my jam so I love this!! Perfect for an unused fireplace (we don’t use ours either). Thanks Emily!! Right? Who doesn’t love a little metallic spray paint? Especially for the holidays! 🙂 Happy weekend, girl! Amanda, this looks great! 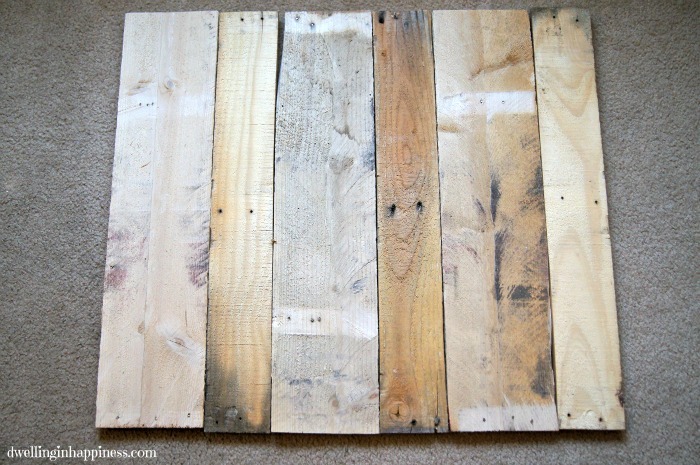 Where did you find the palette wood at? 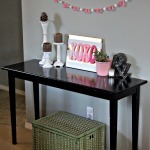 I’ve been wanting to try a palette craft, but have no idea where to find them at… I really love how you added lights to it, SO pretty and a perfect spot for it in your home, too! Thank you, Carrie! I got the pallets at just a freight company here that had piles of them outside their property! I looked on Craigslist under “free” and found a few places that were giving them away; I’d totally check CL! 🙂 I love it with the lights on it! This is adorable Amanda! Love everything about it! 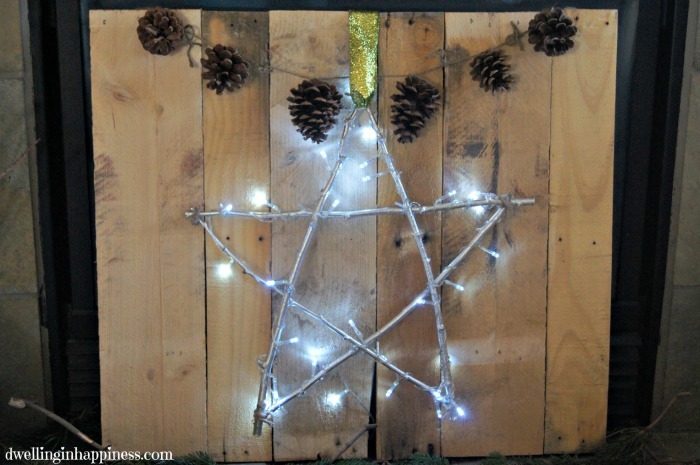 Very cute pallet star light!! 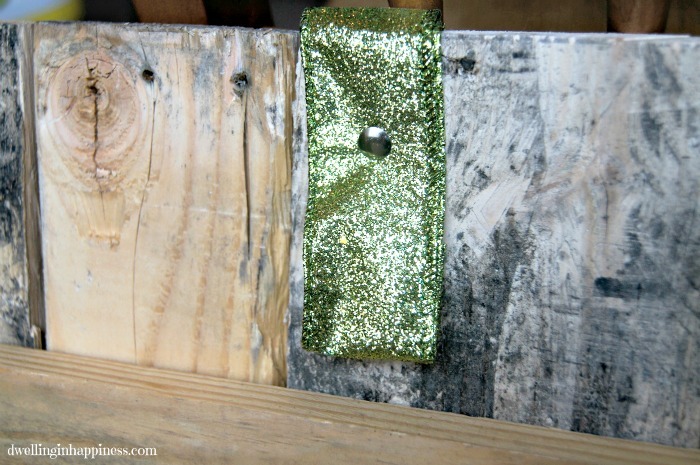 I love how you used recyclable material to make this piece for your mantel. Beautiful!! Thank you, Kim! It’s the perfect simple Christmas decor for our fireplace, and it was easy and cheap! I love that combo. 🙂 Hope you’re having a great week! Thank you so much!! I’ll see you ladies on Monday. 🙂 Happy weekend! I agree!! Thanks Sydney! I love rustic and natural these days. With, of course, a touch of glam. 🙂 Have a great week! Amanda, this is so cute! 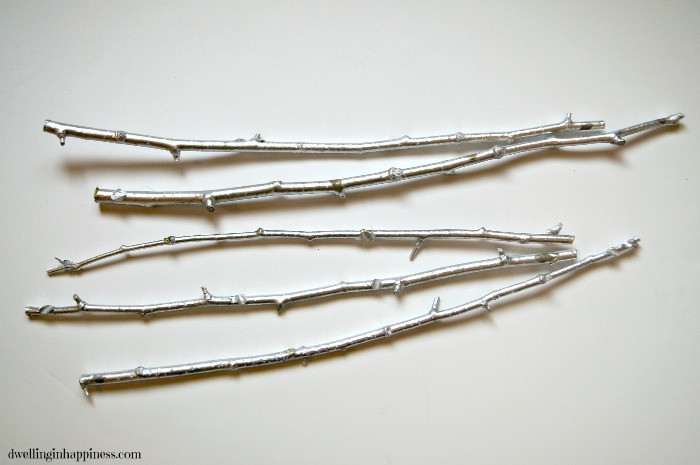 I love the metallic painted twigs, too. And I just can’t get enough of the lights! I can imagine so many uses for those. Perfect. Thanks for sharing this at On Display Thursday, we love having you! 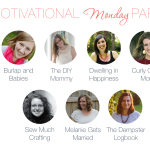 Join us again tomorrow morning! Thank you, Leia! Yes those lights have been used several times, and lots for non-Christmas stuff! I love versatile. 🙂 I’ll see you tomorrow at your party! 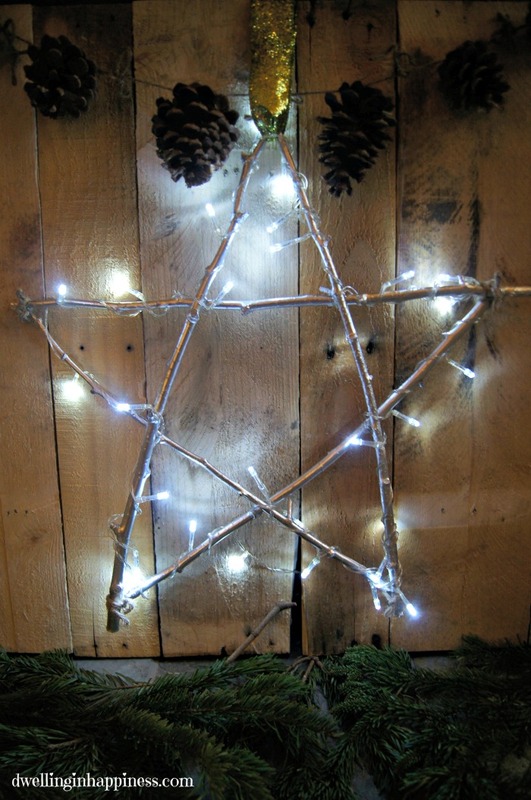 Spray-painting the twigs was such a creative idea, and the star looks so good with the lights! I can’t wait to try something like this for Christmas this year, thanks for sharing! 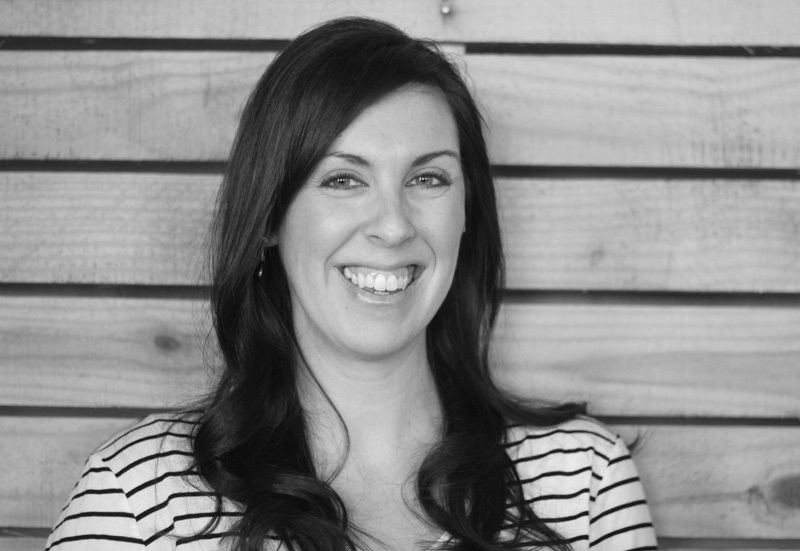 Thx for sharing this tips Amanda! i Will do something like this!